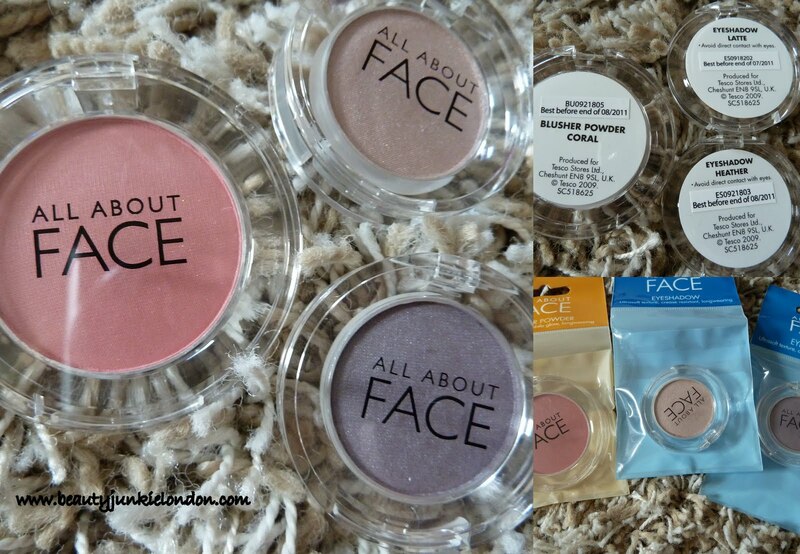 A few months ago I was in a Tesco store and spotted a few very basic looking make up bits called ‘All About Face’. There aren’t any big Tesco stores near where I live in London, so I haven’t heard of these before but they looked interesting and I wanted to try them out. They were for sale at 3 for £5 (I think – might have been 3 for £3, can’t remember – if you know, please comment below). The first thing to catch my attention was the Coral Blusher Powder, it just looked like a really pretty colour, coral with a golden shimmer. I was right, it is pretty – although amazingly smooth, it isn’t very pigmented when swatched but that isn’t a shock for such a cheap product, I did find when applied with a brush it showed up really well. Perhaps it’s similar to a MAC sheertone – purposely more sheer…. Of course, because of the the £3 for £5 (or £3) offer I had to pick up a couple of other bits. So I settled on Heather and Latte – two seemingly standard neutrals, a beige/champagne (latte) and a warm grey with purple undertones (heather). Having now had a play with them I have absolutely fallen for Heather – it’s a silky smooth, gorgeous grey and when swatched the purple tones show more than when they are in the pan. Latte is also nice, but not a stand out for me. The picture has the colours with flash and in natural light. The packaging isn’t too cheap looking, somewhat similar to Shu Uemura in style (obviously different shape though), but not as solid/sturdy/good quality. Also, since I started using them, the pan of the ‘heather’ eye shadow fell out – so clearly quite poorly made. 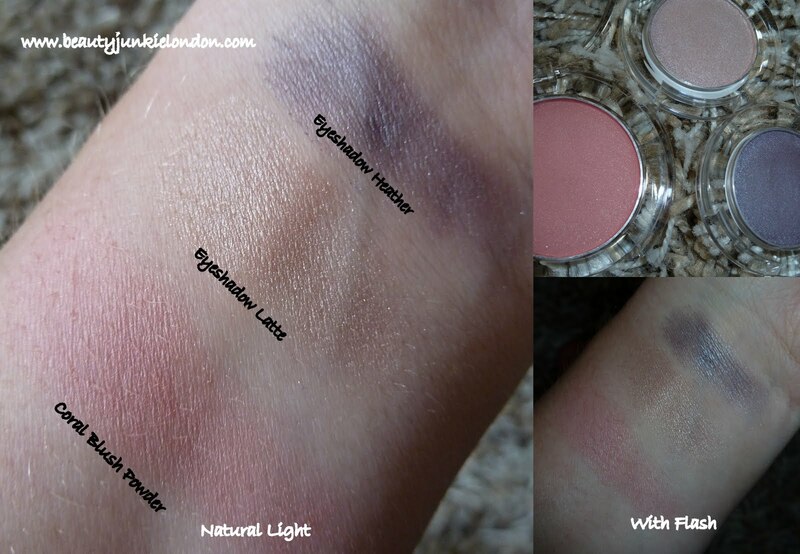 Next Post Illamasqua make up amnesty: will you be throwing down your neutrals? It’s really lovely – i’ve been using it very lightly on top of Nars Penny Lane cream blush and really like it. So pleased I picked these up – very impressed for the price! their eyeshadow pencil are really good, i think it is even better than nyx jumbo eyeshadow pencil. also when i bought them, they were 4 for £3. It does doesn’t it – I knew it looked familiar and just looked up Face Stockholm and it looks very similar. Cheeky! I picked these up in my local Tescos yesterday…there actually 4 for £3 BARGAIN!! I picked up a couple of shadows a clear lip gloss and the bronzer which I have heard other bloggers rave about…not tried any out yet but will review the bronzer soon, let you know what I think……. I love the heather colour- how long do they last? Wow! 4 for 3 pounds! What a bargain! I have to check these out! They last really well over a base. I have been using the blush on top of a creme blush (Nars Penny Lane) and it works really well. E/s lasts pretty well a full work day over UDPP (and looks lovely with the sin version)! which tesco sell these ?